With the launch of the Nokia Lumia 1520 postponed to October, there is still time for more leaks which will reveal everything about the device before the actual launch. While we have seen enough images of the Nokia Lumia 1520 including the press renders of the device, we now have yet another close-up image of the device. The image reconfirms the thin side bezels and proves its authenticity with the Nokia stamp at the bottom. The Nokia Lumia 1520, which would be the first phablet device from Nokia, would feature a massive 6 inch display. Qualcomm has already confirmed that the device would sport its powerful Snapdragon 800 processor. 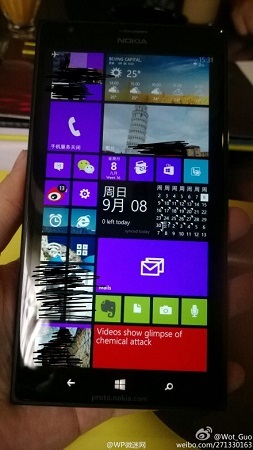 The smartphone would require the latest GDR3 update of the Windows 8 OS for supporting the new specs. The device is expected to be priced at $699. While Nokia has already scheduled an event for October 22, the Microsoft-acquired company hasn’t mentioned about the device, unfortunately rumors did.